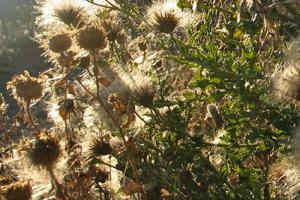 Knapweed is a highly invasive, thistle-like plant that is a major nuisance for gardeners, especially in dry climates. It seems nearly impossible to eradicate once established, even with the use of herbicides, but there are some non-toxic methods of control that are successful if applied with persistence. 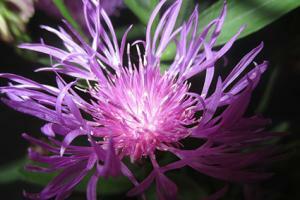 There are several species of invasive knapweed, but the differences among them are subtle. In general, they are taprooted perennials that look like a cross between dandelions and purple thistle. The leaves form a basal rosette in the first year of growth, (meaning they grow as a small clump at ground level with each leaf radiating out from the crown of the taproot at the center), and then send up a flower stalk the following summer. 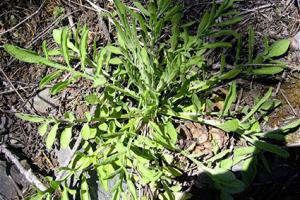 The leaves have large serrations, like dandelion, and are each about six to eight inches in length. The flower stalks rise anywhere from two to six feet in height and look exactly like a small thistle flower with numerous feathery purple or bluish petals. The flowers are typically one to two inches in diameter and emerge from a swollen bud with characteristic brown markings that make it look like it has been singed by fire. 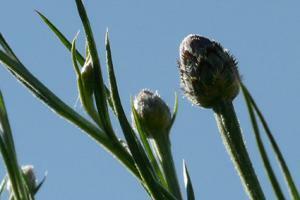 Part of knapweed's secret to success is its ability to thrive in extremely dry, infertile soil. The good news is that it does not tend to colonize rich, moist garden beds. So one general management strategy is to improve the soil by adding copious quantities of compost and irrigating regularly to encourage other species. In areas that are already infested, however, this strategy will have little immediate impact. In small areas it is possible to eradicate knapweed by manually removing it. If it is just starting to show up in your yard, being vigilant about pulling up seedlings as they appear can prevent it from ever becoming established. The difficulty with this technique is the enormous taproot. Any portion that is left in the ground will re-sprout and it tends to break off if you pull on it from above, leaving a chunk buried in the ground that is then very difficult to find. Irrigate the area heavily to make it easier to pull the roots out intact. Use a shovel, digging fork or mattock to carefully pry up the taproot in an effort to remove it in one piece. It's easiest to do this in summer after the flower stalks have emerged, as they make a good 'handle' for pulling. If you don't get it done during the summer, definitely do it well before the plant flowers and sets seed; a single flower produces thousands of seeds which germinate readily and cause the plants to get out of hand in just a couple of seasons. Dispose of the entire plant in the trash or burn it. Even a flower bud that has not yet opened is capable of opening and setting seed while sitting in a brush pile and the taproots may re-root themselves and continue growing if left sitting on the surface of the soil. Repeated mowing to prevent knapweed from flowering and making seed is another strategy that is more effective in managing large areas. Mow on the lowest possible setting in an effort to cut the leaves growing close to the ground. Constantly removing the top growth will deplete the energy stored in the roots and will eventually cause the plants to die. With repeated mowing, the plants will try to quickly send up short flower stalks to make seed and reproduce, making it necessary to cut them on a weekly basis. It's also critical to look for, and cut down, plants that may be at the periphery of the property in hard to reach areas like a roadside ditch fence line, steep slope or hedgerow. Cut these with a weed wacker, or pull them manually, to prevent them from seeding the rest of the yard. Using predatory insects as a form of weed control is another approach. 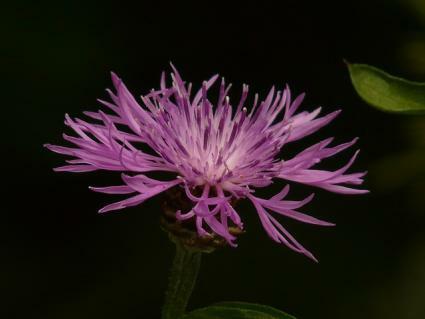 The reason that knapweed is so invasive in North America is because it lacks the natural biological control of the ecosystems where it originates in Russia and the Far East. Fortunately, there are companies that sell these insects here exactly for this purpose. There are bugs that eat the roots, leaves and even the seed heads, making this the easiest, most natural method of knapweed control. The drawback of this approach is that there is little guarantee that it will work. There are so many environmental factors at play determining the behavior, or even survival, of a small batch of insects grown in a lab and released in a place they are not native to that results vary. Research is ongoing to determine the best predator insects to use for knapweed. Knapweed is extremely difficult to eradicate, but with persistence, a reasonable level of control can be expected. As with any invasive species, take care to avoid spreading the seed unintentionally to other areas via the movement of soil, tools or clothing.